I love Halloween. More importantly, I have mad respect for anyone that can put together an awesome costume. And what makes an awesome costume? The keys to a great Halloween costume are recognizability, creativity, and effort. To speak to that first key, what’s more recognizable and crowd-pleasing than a food-themed costume? Now, the easy way would be to search for one of the million purchasable food halloween costumes out there, but that would mean completely ignoring the other two keys to a great costume, and thus be unacceptable. Instead, check out these tips and tricks for creating the best food-themed Halloween costume yet! Be a food. Having trouble thinking of a costume this year? Open your fridge! Nearly every food item you see can be made into a costume from a bunch of grapes (attach purple balloons to yourself in grape bunch formation) to a bacon and egg couples costume. The most creative I’ve seen in this category was a pair of baked potatoes complete with aluminum foil wrapping, yarn for cheese, and pats of construction paper butter. Wear food.You’ve seen Lady Gaga’s infamous meat dress. What about Nicki Minaj’s chicken wing necklace? Never underestimate what some food-accessorizing could add to your costume. The ever popular “cereal”-killer (created by taping mini cereal boxes covered in blood to yourself) is always a hit. Brands. 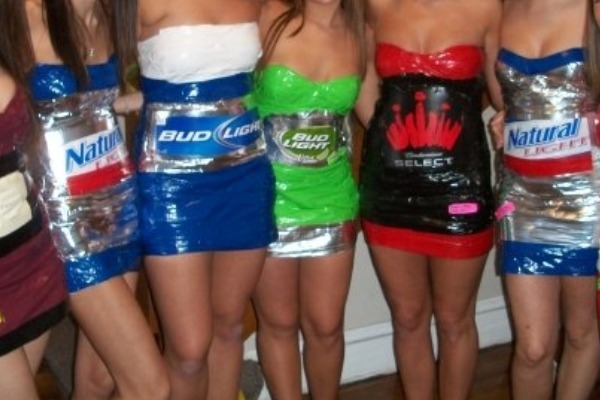 Like the photo above of various beer cans (and a wine bottle), brand names add detail and recognizability to your costume. For example, simply printing a Campbell’s label from the Internet and pinning it to your can-like outfit can easily make your soup costume into a masterpiece! Mascots. From Cap’N Crunch to Colonel Sanders of KFC, mascots provide an endless supply of material for Halloween costumes. One of my all-time favorites is shown in this picture of Mrs. Butterworths, a simple syrup mascot costume. 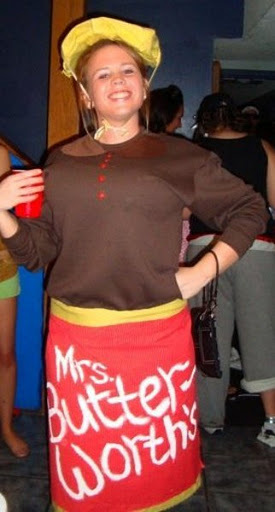 All you need is some extra brown and red clothing, a bit of fabric, and a little paint! Foodies. Last, but certainly not least, the foodie category can provide much entertainment on Halloween night. With these costumes, not only do you get to dress like someone else, but you get to change your persona (and perhaps accent) as well! So why not mimic Meryl Streep, don a floral top and transform yourself into Julia Child for the evening? Or, grab an aggressive attitude and stark white chef coat to march about as Gordon Ramsey. Other ideas: grab orange crocs and go as Batali, or get a crew together to dress up as the whole cast from your favorite season of Top Chef. Cheers to a holiday full of spooks and treats! Shannon Kelley is a graduate student at Truman State University. Her favorite Halloween was two years ago on which she donned an intricate Facebook costume and stayed in “character” for the entirety of the evening. If you wish for to obtain a good deal from this piece of writing then you have to apply such methods to your won blog.